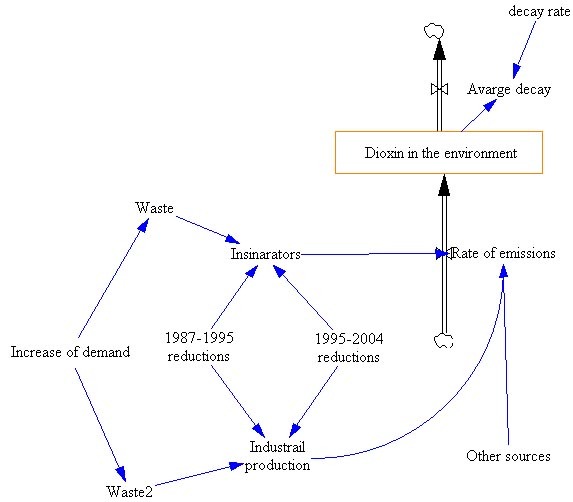 This model represents 3 primary sources that contribute Dioxin in to the environment. Each year, a small amount of waste material is added to the industrial, and incineration process, which is meant to account for the increased use of Chlorine. Starting in 1987, I also introduced an emissions reduction factor that removes a certain percentage of Dioxin from the exhausts. This model also takes in to account the natural half-life of Dioxin, this factor reduces the level of dioxin by half every few years.